This is Spike, he is almost a year old and definitely the most spoiled porcupine I've ever seen. He's telling me here we're out of cookies. We found him [Spike] when he was just a little baby, he was sitting out in a field all by himself and weighed all of about one pound we wrapped him in a jacket and brought him home. When we got him home the jacket he was wrapped in was full of quills! After a couple of days we could touch him. Now Spike weighs about ten pounds and is growing every day. The original idea was to help him get his health back, fatten him up a bit and then take him back to where we found him. Well, he is such a baby now. He cries when we put him outside and snuggles me like a big teddy bear! (I do not have any problems with the wildlife department because he is a rodent, and there are no laws against owning porcupines.) He doesn't even want to eat anything he's supposed to. He wants whatever we have and loves bananas and bread. He is so spoiled he makes me take the crust off his bread and if it's not fresh - forget it! He doesn't want it. He is a wonderful pet. He is very affectionate and loves everybody. 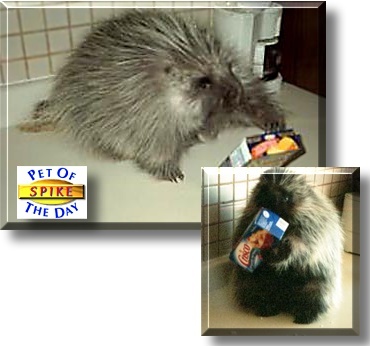 Porcupines are nocturnal but Spike is far from normal. He likes to be awake when the people are. We have never had a problem with quills because they are protection for the porcupine and only raise their back if they feel threatened or danger. Spike has no idea what a threat is so therefore always has his quills down. His favorite friends are our two dogs and three cats. He plays with all of them and likes to snuggle with the cats [I guess because they are soft]. He jumps right up on our dogs and they wrestle together and he'll spin around in circles and run through the house . He is a lot of fun to have around. He loves to lay on me and be petted for as long as I will let him. He also loves all people but especially me [his mom] Even though Spike is very sweet and gentle, just like all porcupines he does have about 30,000 quills on his body!! The quills are located underneath a thick coat of hair so it is very easy to pet and snuggle him without ever feeling the very sharp quills. The porcupine uses the quills in defense when they are scared or threatened. Spike has no idea what a threat is and therefore his quills are always laying flat on his back causing no harm to anyone. Please feel free to read all about Spike and how we got him.